Small Acts of Kindness are Big! A helping hand doesn’t need to be big in size. Small acts of kindness are the helpful attitude that matters the most. There are a few sides to each act of kindness. Everyone benefits. The gift of kindness is wonderful and natural process. More than that, notice the response of each recipient of the gesture. Notice the feeling of appreciation. It’s not about the money or the gift. The idea that there is good in the world, no matter how small is comforting to people. The idea that someone cares enough about you to give to you, can be emotionally healing. Gestures of kindness lead to peace in the world. The best are the witnesses of kindness like you see the young girl in the video below. Kindness, now, is ingrained within her. It’s part of her. The rewards she feels at a young age will be lasting. Spend a minute (and 50 seconds) watching this video of random acts of kindness performed. A helping hand doesn’t need to be big in size. 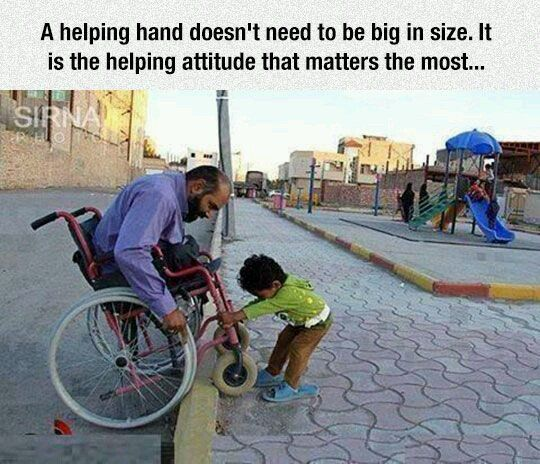 It’s the helping attitude that matters the most. It begins with the thought and intention. People become down and out for their own reasons. They can be attracted to it. Having someone or something to lift them up is healing. Having someone care about them is just what the doctor ordered. No matter how big or how small, any act of kindness and support that puts another person at ease, is worth it. Pass on an small acts of kindness today.